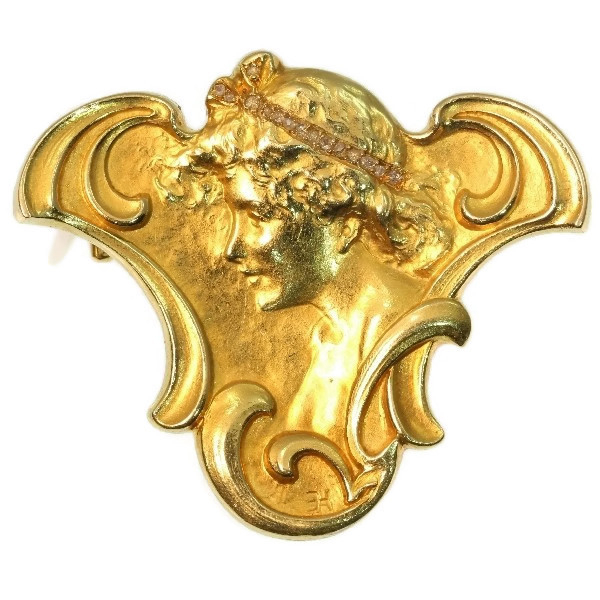 Art Nouveau brooch pendant with human head wearing diamond hair band: Description by Adin Antique Jewelry. Style: Art Nouveau - Art Nouveau (French for New Style) is an international movement and style of art, architecture and applied art - especially the decorative arts - that peaked in popularity at the turn of the 20th century (1890–1905). The name "Art Nouveau" is French for "new art". It is also known as Jugendstil, German for "youth style", named after the magazine Jugend, which promoted it, and in Italy, Stile Liberty from the department store in London, Liberty & Co., which popularised the style, and in Holland as “Sla-olie-stijl”, Dutch for “salad oil style” after a advertisement poster for this product that was made in that style. A reaction to academic art of the 19th century, it is characterized by organic, especially floral and other plant-inspired motifs, as well as highly stylized, flowing curvilinear forms. Art Nouveau is an approach to design according to which artists should work on everything from architecture to furniture, making art part of everyday life. Although Art Nouveau fell out of favour with the arrival of 20th-century modernist styles, it is seen today as an important bridge between the historicism of Neoclassicism and modernism. Style specifics: Art Nouveau - Although Art Nouveau took on distinctly localised tendencies as its geographic spread increase some general characteristics are indicative of the form. A description published in Pan magazine of Hermann Obrist's wall-hanging Cyclamen (1894) described it as "sudden violent curves generated by the crack of a whip", which became well known during the early spread of Art Nouveau. Diamond(s): 15 rose cut diamonds and senailles . A senaille is a simplified rose cut diamond, a small diamond chip with perhaps a few polished facets. We do not have the weight of the rose cuts diamonds nor the senailles which is normal in our trade when it comes to rose cut diamonds and senailles. Monogram: HE in mirror writing. We do not know who this HE or EH might be. When you do know, please be so kind to share this info with us?